Julie Kathleen Campbell had two certainties as a teenager; helping people and living with horses. Little did she realize these two life passions would merge as one. Julie obtained her degree in psychology from Sherbrooke University and her Master’s in Community Psychology from the University of Quebec in Montreal. Before starting her private practice in nature-psychotherapy and wellness, she founded the Suicide Prevention Centre le Faubourg in the Laurentians (Quebec) and was the Executive Director and Clinical Supervisor for over 20 years. She has practiced as a clinician and a clinical consultant specialising in crisis intervention, suicide prevention, distress, bereavement and trauma. She is an accomplished presenter and has facilitated workshops and training nationally and internationally. She is bilingual, in English and French. As a Nature-psychotherapist and wellness practitioner Julie combines alternative and innovative approaches that incorporate every aspect of the person (mind, body, emotions and spirit) as well as one’s connection with the social and natural environment. She is a Certified Rituals Practitioner trained in Canada and the USA where she has focused on the importance of rituals in everyday life. She provides individual and group therapy for depression, anxiety and other mental health problems as well as for day to day stresses. She also co-founded “Soulful Nature Way” (www.soulfulNatureWay.com), an organisation where she leads workshops on mindfulness practice, personal development through self-understanding, healing and spiritual growth where her powerful energy supports people’s journey with great simplicity. She is recognised for her awareness, her compassion and her creativity in her teachings. When she discovered the natural mindful state and highly intuitive capacities of the horses, Julie knew right away they would become key partners in her work. 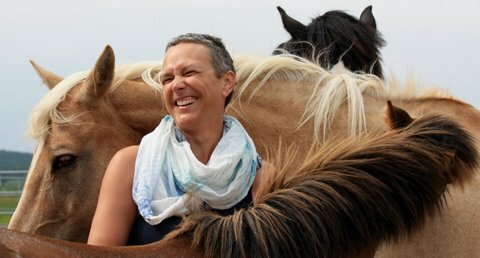 She is now a FEEL certified facilitator from Horse Spirit Connections and she integrates her equine co-partners in her practice and her vision of creating harmony between humans, nature and the horses as the wise ones. She is a Member of the Quebec College of Psychologists.